This week our quiet sun came alive, and the visible solar disc now is crowded with sunspots. On Monday, May 11, the SESC daily sunspot number rose to 188. That is the highest sunspot number since January 30, when it was 193. We have to go back to November 17, 2013, to find a higher sunspot number. It was 282 on that day, which was way over on the other side of the peak in Cycle 24, which happened around February and March of 2014. The average daily sunspot number increased 86 points from the previous week to 146.9 for the current period, May 7-13. Over the same period, the average daily solar flux rose from 115.4 to 156.3. At 2324 UTC on May 12, the Australian Space Forecast Centre issued a geomagnetic warning: “Increased geomagnetic activity expected due to high speed coronal hole wind stream for 13 May 2015.” Indeed, the prediction was correct, and the planetary A index for May 13 was 45, while the college A index reached 63. The predicted planetary A index is 12, 10, 20, and 15 on May 15-18, then 5 on May 19-28, 8 on May 29-30, 5 on May 31, then 8, 15, and 10 on June 1-3, 5 on June 4-6, 12 on June 7, 25 on June 8-9, and 12 and 8 on June 10-11. Predicted solar flux is 140 on May 15-16, then 135, 125, 115, and 105 on May 17-20, then 100, 105 and 115 on May 21-23, 110 on May 24-27, 115 on May 28, 120 on May 29-31, 130 on June 1, 140 on June 2-4, then peaking at 160 for the near term on June 9. The OK1HH geomagnetic activity forecast sees quiet to active conditions May 15-17, active to disturbed May 18, quiet to unsettled May 19, quiet May 20-23, mostly quiet May 24, quiet to unsettled May 25, quiet May 26-27, mostly quiet May 28, quiet to unsettled May 29, quiet to active May 30, quiet to unsettled May 31, active to disturbed June 1, mostly quiet June 2-4, quiet June 5-6, quiet to active June 7, active to disturbed June 8-9, and disturbed June 10. The NASA Solar Cycle Prediction remains the same, but yesterday the date wasupdated from January 14 to May 14, 2015. That is all that changed; there is no new forecast. The Washington Post weather blog posted this article about sunspot 2339. Dave Pedersen, PJ4VHF/N7BHC, reports 2 meter CW reception on Bonaire of the D4C/B beacon in Cape Verde via tropospheric ducting. Bonaire is just north of Venezuela in the Caribbean and Cape Verde is off the coast of Africa, west of Senegal — a distance of 2917 miles. The signal was heard on May 6, 2015 at 0100-0230 UTC on 144.436 MHz, using a Kenwood TS-2000 and two 13 element Yagis at the receive site. The beacon on the other end runs 20 W. Dave reports the reception was verified by Andre, HB9DUR, the beacon operator. Dave also sent an audio/video file showing the receiver, and the CW signal is clearly heard (click on “Download This File”). Jeff, N8II, reports that conditions were excellent on 15 meters on Saturday, May 9, into Central and West Asia at 1400-1500 UTC during the CQ M Russian contest. This X2.7-level flare produced a level R3 (Strong) shortwave radio blackout on the sunlit side of Earth, which was over the Pacific region. A coronal mass ejection was associated with this flare. 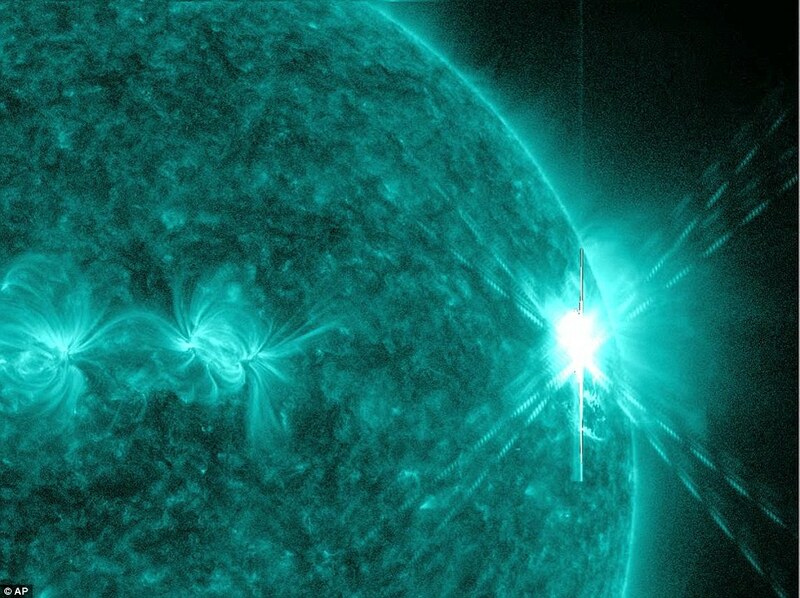 The flare originated in Sunspot Active Region NOAA 2339. In addition, the flare produced a 2-minute radio burst, heard as a roar of static from shortwave receivers on Pacific isles and western parts of North America. A radio burst of this kind is generally short-lived but can cause interference for radar, GPS, and satellite communications. Visit the ARRL Technical Information for more information on radio propagation. For an explanation of the numbers used in this bulletin, see this article. Anarchive of past propagation bulletins is on the ARRL website. Carl Luetzelschwab, K9LA, offers additional information and tutorials on propagation on his website. Archives of the NOAA/USAF daily 45-day forecast for solar flux and planetary A index are in downloadable spreadsheet format. Click on “Download This file” to download the archive, and ignore the security warning about the file format. Monthly propagation charts between four US regions and 12 overseas locations are on the ARRL website (scroll down). Instructions for starting or ending e-mail distribution of ARRL bulletins are on the ARRL website. Sunspot numbers for May 7 through 13 were 131, 134, 136, 134, 188, 170, and 135, with a mean of 146.9. 10.7 cm flux was 146.6, 149.8, 154.5, 159.9, 163, 163.2, and 157, with a mean of 156.3. Estimated planetary A indices were 6, 6, 7, 11, 15, 15, and 45, with a mean of 15. Estimated mid-latitude A indices were 6, 7, 8, 12, 15, 16, and 25, with a mean of 12.7.